Want to create a fabulous org chart fast and funnily? 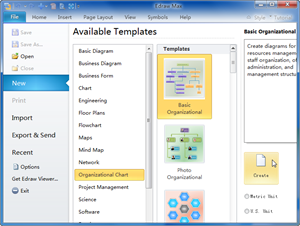 Organizational charts creation is a breeze with Edraw, because its shapes are smart with floating help dialogues and automatic connection feature. Follow some guidelines to make more professional-looking org charts. Three simple ways are available to create an organizational chart. You can start from a blank organizational chart drawing page, import data directly and make use of the templates. The first two ways will be illustrated below. Let's focus on how to start from a blank page firstly. To make your chart more professional and polished, go to Top Tips to Make Org Charts Work for reference. Also, we've created a video tutorial to help you get started with Org Chart: Video Tutorial - How to Create an Org Chart. 2. On start page, click Organizational Chart in Template Categories list. 3. Click Create to open a blank organizational chart drawing page. 4. The Organizational Chart libraries and Org Chart tab open. 5. Drag a shape onto the drawing page. Only drag-and-drop is required to draw a fabulous org chart, saving time and effort. The auto connection and relayout function make the process quite fun. There are several ways to achieve this goal. The easiest ways are as follows. 2． Click the left floating button to add colleague. 3． Click the bottom floating button to add subordinate. 1. Select the shape you want to add assistant to. 1. Drag a shape over the right floating button of the target shape to add colleagues. Release mouse when a red box shows. 2. Drag a shape over the bottom floating button to add subordinate. Release mouse when a red box shows. After adding many shapes, the chart may be too loose or too cramped. You can use the Layout tools on Org Chart tab to make the diagram in order. 1. Select Auto Layout check box to enable auto layout mode. 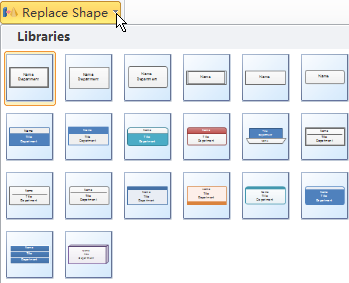 Under auto layout mode, the whole diagram will be re-arranged every time you add or delete shapes. 2. Under the default layout mode, sometimes shapes may overlap other shapes. To avoid this problem, you can move away the shape manually, or start auto layout mode, or click Relayout on Org Chart tab to re-arrange the whole diagram. 3. Choose the pre-defined layout styles in the Layout group on Org Chart tab alternatively. If you only need to change the layout of a branch or parts of the chart, select the top position shape of that branch and choose the layout mode you want. 4. Click Distance on Org Chart tab to Increase/Decrease Horizontal/Vertical Distance, or click Move Left or Move Right buttons if you only need to make some minor changes. On Org Chart tab, in the Organization Data group, click Define Field. In the Shape Data dialog box, you can define the shape data fields. The modification will be applied to all the shapes in the diagram. Click Display Options on Org Chart tab. 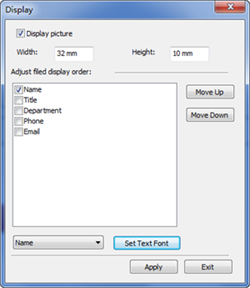 In the Display dialog box, you can define the display data fields, display order and the font style of the fields and the size of the shapes. The modification will be applied to all the shapes. Double click the shape to add text. When the information is overloaded in the shape, it may not be able to display all text. In this case, increase the width or height of the shape. Enter larger values in the Display dialog boxes. 1. Click Replace Shape in the Replace group on the Home Menu. 2. Pick the shape style you prefer from the Libraries. Thus your chart can be more visually appealing. 1. Move the pointer over the right floating button of the photo shape. 3. Locate the photo you need. 1. Click Save on the Home Menu to save as the default format. 2. Choose Save as on the File Menu to save as more other formats. 3. 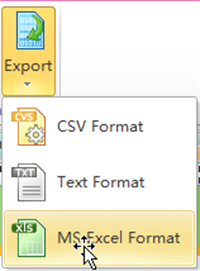 Click Export on Org Chart tab to export it as MS excel format. Thus, you can save the data and use it as a temple when you need to create organizational charts by importing data. 1. Click Import on Org Chart tab. 2. Click Browse... to locate the file that contains your organizational chart information. Voila! Your desired organizational chart has been created without hassle. When you open an example in the Organizational Chart Templates, the Organizational Chart Shapes stencil opens at the same time. 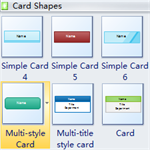 Shapes for organizational charts mainly include two categories: Card Shapes and Photo Shapes. If you need to present your staff's photos, choose Photo Organizational Chart Templates. 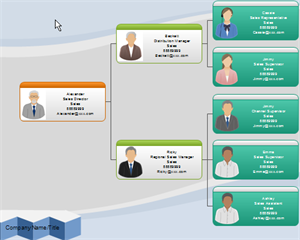 Edraw's Organizational Chart Templates are loaded with a host of examples that can be used to visualize various kinds of organizational structures. The following is an example of Corporate Org Chart. You can gain more in page: Orgnizational Chart Examples.